Next up in our series of reviews for the Softube Volume 1 package is the Softube Summit Audio TLA-100A, an emulation of Summit Audio’s classic compressor that has been a mainstay in the music production industry since the 1980s. 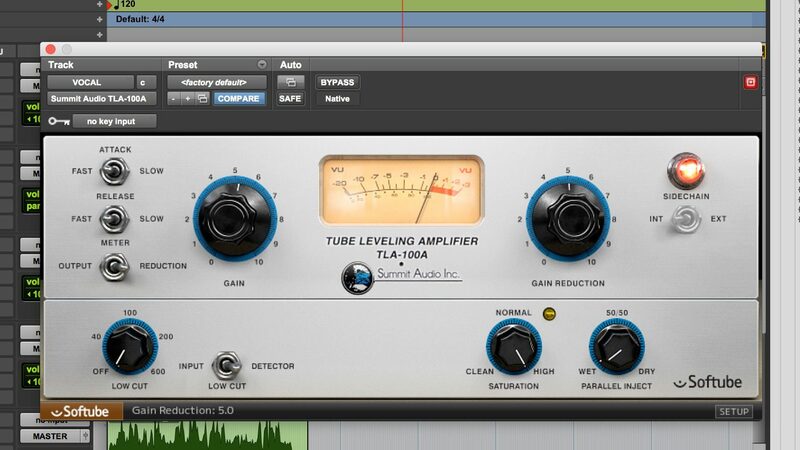 Rather than making a straight copy of the original Summit Audio compressor, however, Softube has added its own touch to the plugin, something that gives the virtual TLA-100A a little more character, and may make it even more useful than the original in your arsenal of top-tier compressors. So how well does the compressor perform? We put it to the test to find out. The TLA-100A plugin offers a pretty photorealistic look of the original TLA-100A — a trend the company has followed with other plugins too. That can either be good or bad, depending on where you sit — while it’s helpful for those already familiar with the TLA-100A, some might prefer an updated look. In any case, look is only part of the equation — the interface doesn’t just look good, it also navigates pretty well. On the top left you have switches to control attack, release, and whether the meter is output or gain reduction. Directly next to those controls you’ll find a gain knob, which is opposite a gain reduction knob that sits on the right hand side of the plugin. Here’s where the virtual version of the TLA-100A diverts from the original. At the bottom of the interface, you’ll find a low cut filter, allowing you to control the bass response to either the internal or external sidechain. That’s a pretty nice addition, especially if you’re controlling something that has a lot of lower frequencies. On the other side, you also get a saturation control, giving your track that classic-sounding warmth without needing to push the input too hard. Last but not least, you’ll get a parallel inject knob, which lets you control the wet/dry levels and is perfect if you want to use the plugin for parallel compression. While that Parallel Inject button is a nice addition, you may not find yourself using it — that’s because the plugin is pretty gentle, and if you’re parallel compressing, you’re probably going to reach for something a little heavier. That gentleness, however, is exactly what we want to hear from a TLA-100A emulator. You can most certainly hear the compressor working, but it never sounds overdone. Slap it onto a vocal and you’ll get a lot more presence. Run it through a bass, and everything sounds a lot smoother. Acoustic guitar troubles? The TLA-100A will caress that guitar into submission and get rid of some of those low booms along the way. The saturation knob is particularly welcome, giving especially vocals that classic distortion that many know and love so much. That’s not to say you need it — you can still drive the compressor the same way you would any other compressor, but the saturation knob means you don’t necessarily have to. Softube has really hit a home run with its emulation of the Summit Audio TLA-100A. In fact, the company has gone above and beyond, not only offering the essence of what you loved from the original TLA-100A, but giving you a little extra too. You can get the plugin for yourself by heading to the link below, or you can get it as part of Softube’s Volume 1 bundle.